Since been thrashed by Denmark in the World Cup Play offs there has been a lot of doom and gloom around Irish football. It was very disappointing for Ireland not to make it to the World Cup and the hangover continued with a defeat away to Turkey in February and then the Irish were given a bit of a lesson by France last week in Paris. The Turkish game was the beginning of a new era for Martin O’Neill after players retired but on the night the game was a dour drab affair. It was ninety minutes of sheer boredom and to be brutally honest the Irish offered nothing. It was a struggle to find any positives out of the game, but one did come along in the shape of West Ham United,s Declan Rice. On his Irish debut he was man of the match and he put in a display that any nineteen year old would have been proud of. After the game a lot of the talk was that O’Neill had unearthed a gem, not only had he done that but he had stolen him from under the noses of England. As often happens with Irish players Declan qualifies to play for the Republic as is grandparents are from Cork. On the night it was the only bright light at the end of a very dark tunnel and although Turkey won they did not show much either. 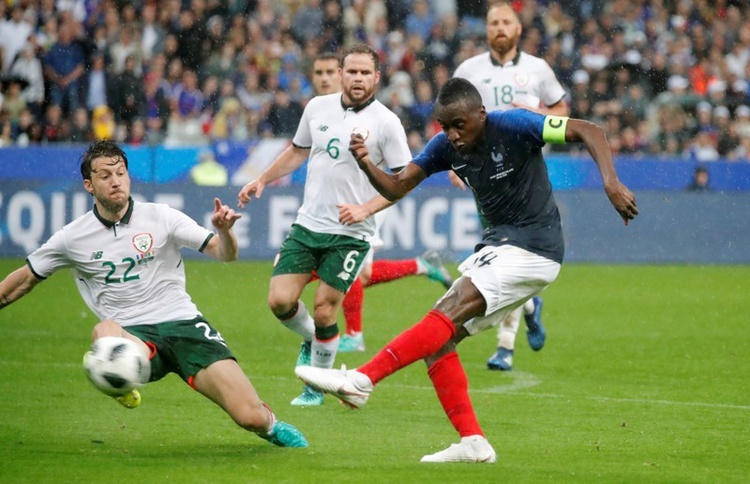 Although the Republic of Ireland are not going to Russia, they had set up a few end of the season matches against France in Paris and then to finish off the long season they played the USA in a friendly in the Aviva Stadium in Dublin. The game in Paris was played in terrible conditions with torrential hail and rain belting down on the twenty two players for ninety minute minutes. The French ran out easy winners with goals from Giroud and Nabil Fekir. Mind you the second goal was a terrible mistake by goalkeeper Doyle who instead of putting Fekir,s shot around the post, managed to parry it up and over himself and into the back of his own net. Martin O’Neill had picked a really experimental side as he had quite a few of his regulars out with injuries, but he played the same system as usual and it what can only be described as a holding job, the Irish never got a sniff of a chance. Two decisions Martin made on the night were to hand a debut to Blackburn Rovers Derrick Williams and the player did not let his manager down, putting in a strong calm and relaxed performance. Martin,s second decision was to create history when he brought on Shamrock Rovers player Graham Burke in the seventieth minute, the first League of Ireland to be capped since Joe Gamble of Cork City in 2007. It was a great achievement for the player and great news for the league also, but overall the French ran the show and deserved their win. Martin O’Neill has a lot of work to do going forward but his blooding of new players can only help that. If the weather in Paris was horrific for the French game, well the total opposite could be said for Ireland’s last game of the season against the USA. It was an incredible evening in Dublin as the temperatures off the pitch soared, it was short sleeves and shorts all around for the 32,000 fans who turned up to see what Ireland could produce against a very under strength USA. Although this was a friendly it was also a celebration to say goodbye to one of Ireland’s great’s John O’Shea who was retiring after earning over a 100 caps for his country. Gentleman John has decided the time is right to go and he leaves so many great memories and great performances behind, it will be a long time before we see his like again. The first thirty odd minutes of the game were slow and had the feel of a testimonial about it, but once O’Neill called O’Shea ashore the tempo of the game rose and we had a meaty affair on our hands. The USA took the lead right on half time and yet again it was when Ireland were defending a free kick. It came about when a long free kick was floated to the far post and somehow found its way back across the penalty area to Wood who tapped home. It was awful defending by the Irish as they allowed a ball to travel a huge distance without someone making any sort of a move to go and clear it, in fact once the ball came back across his goal, keeper Colin Doyle should have commanded his area, instead everyone stood still allowing Wood to sneak in and grab the lead for the away team. The Irish equaliser came from Shamrock Rovers player Graham Burke who tapped home on the line, his goal was another piece of history as it was the first goal scored by a League of Ireland player since 1978 when the late Ray Treacy scored against Turkey. The equaliser gave the whole team and the stadium a lift and Ireland kept going right to the end and in the dying moments of the game Alan Judge buried a chance which was created by James McClean, it was magnificent for Judge as he has not long returned from a broken leg. Overall the Irish deserved the win and it was a promising display from a new look side. On the night the outstanding player for the Irish was Declan Rice and once again he was named man of the match, that says a lot about this nineteen year old as he has only started three senior games and on two occasions has won that honor. He looks very cool on the ball and similarities are now been mentioned between himself and former Republic of Ireland great Paul McGrath, it is a big pair of boots to fill but if Declan can keep going with his progress it could possibly happen. The result finishes off a disappointing time for the Irish and it is onwards now to the next set of fixtures and hopefully Martin O’Neill can get his side back to winning ways. Previous articleFred set for Old Trafford medical!